Every game on Gamestar Mecahnic is a collection of elements that function together in a system — you can use a nearly infinite level of creativity when creating and arranging these elements. Games consist of a number of sprites. These sprites are initially laid out in the spaces of a grid by the designer, and from there, they can move or act or be created or destroyed. It’s your job as the designer to arrange sprites in a fun, engaging way. The visual style of a game is determined by the kinds of sprites and backgrounds you use, and the gameplay is defined by how you position these components. Check out this example of a simple game that uses only a few sprites with rudimentary abilities. As a player, you control the little blue avatar in the lower-left corner, using your keyboard to make the avatar move up, down, left, or right. 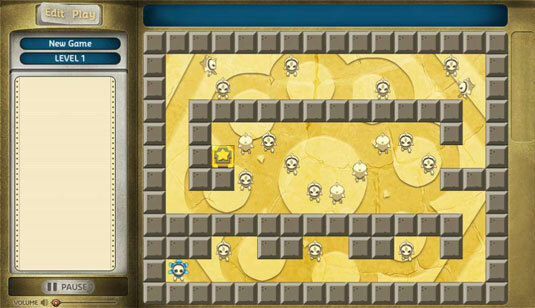 The goal is to navigate your avatar to the goal block, which is the yellow block enclosing a gold star. Touching this block allows you to win the game, but it’s being guarded by several white sprites that pace around and destroy the avatar on contact. If the avatar is destroyed, you must restart the level. It’s top-down. Essentially, the player is looking down on the sprites from above, watching them move around a two-dimensional landscape. From a designer’s perspective, you must understand the benefits and restrictions of a top-down game. It’s navigational. Navigational games are the simplest to design and play in Gamestar Mechanic, because you just have to reach one or more objectives while avoiding enemy sprites. Other games may require you to frag the enemies, survive by way of skill and reflexes, or satisfy various other goals and rules. These sprites are the only ones that appear in the game. No matter how long you’ve been on Gamestar Mechanic, you have all the resources you need to make this game right now.